Secret Millionaire Bot Review - Scam? UGLY TRUTHS revealed here! Home > Online opportunities > Secret Millionaire Bot Review – Scam? UGLY TRUTHS revealed here! Welcome to my Secret Millionaire Bot review! Are you wondering if you can make $2,479 a day with this system? Or is secretmillionairebot.com a scam that you need to avoid at all costs? First of all, congratulations on doing your own research before buying into another money-making product. As you can imagine, there are lots of frauds out there and they come in all forms, so doing your due diligence is the way to avoid scams and learn how to make passive income every day. To be completely transparent with you, Secret Millionaire Bot is not as awesome as you have been told, so keep reading this post to find out everything they are hiding from you. 2 What is Secret Millionaire Bot about? 3.1 Will you make money with Secret Millionaire Bot? 3.3 Does it only cost $37? 3.4 What else is fake about Secret Millionaire Bot? 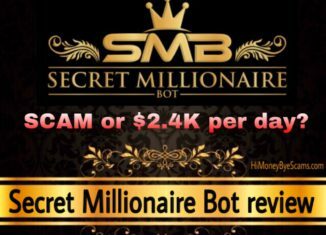 4 Is Secret Millionaire Bot a scam? 5 How do I make passive income every day? What is Secret Millionaire Bot about? I recently got an email concerning the Secret Millionaire Bot system, so I started wondering if this program would be like many of the scams I come across or if it would be worth it. Honestly, when I read the title I didn’t get good vibes because it makes it sound like a get-rich-quick scheme. I mean, many of the products that have the “millionaire” or “secret” words on them tend to be low-quality products or scams. Also, I noticed some red flags on the sales page, which made me start suspecting… But before reaching a final conclusion, I wanted to look deep into this product, so I did my homework. According to the spokesman, you are one of the lucky ones who have been allowed into a secret club of online millionaires. Doesn’t it sound amazing? After that, he starts showing some income proofs to make you believe that he’s been making millions of dollars. This is something he does to get you excited and lead you to believe that you can make that kind of money with this system. The spokesman claims he’s going to show you how to become a millionaire within a year using a push-button software that can make you money on complete autopilot. He even says that this has nothing to do with Bitcoin, MLM or get-rich-quick scams that promise you will make millions overnight. However, a get-rich-quick scheme doesn’t necessarily mean that you are going to earn millions overnight. A product that’s advertised as the solution to making thousands of dollars within a short period of time can also be considered a get-rich-quick scam because “rich” is not the same as “millionaire”. So don’t be fooled by the ones who promise you a lot of money but claim they’re not scams. He talks about scammers to make you believe that he’s on your side, but he’s not doing anything to prove that he’s not a scammer. The kind of claims he makes are the claims that scam artists make, so how is he any different? The whole sales video is pure hype because “Charles” basically tells you what you would like to hear in order to get you excited and make you purchase this product. And then, once you have bought the product, you realize it’s different from what they told you. What they tell you outside is not what you are going to see inside. Secret Millionaire Bot does not work the way “Charles” told you because you are not getting a revolutionary system that can help you become a millionaire. You are not even getting a system that can make you money on autopilot because systems like that don’t exist. I mean, there’s no website or place on the Internet where you can push a few buttons and start making money immediately without doing much work. Instead, you are getting some basic and generic training on how to earn money with affiliate marketing, which is a legitimate business model that I personally use to make passive income every day. If you have never heard of it, as an affiliate marketer you get the opportunity to promote other people’s products/services and earn commissions. The problem with Secret Millionaire Bot is that it’s not being marketed in a way that gives you realistic expectations. It’s completely possible to make a fortune using affiliate marketing, but it definitely does not work like Secret Millionaire Bot advertises because this business takes effort and time to build. You can ask any successful affiliate marketer what it takes to make this business profitable and no one will tell you that they have achieved overnight success. Anyone who claims to have got great results within a very short period of time is lying to you to take your money. So don’t be fooled by people who want you to believe this is easy! Will you make money with Secret Millionaire Bot? You may earn some money thanks to the training provided by Secret Millionaire Bot, but it will definitely not help you make millions. I have reviewed hundreds of products like this one, and it turns out that many of them usually provide some outdated training or material that can be found for free online. That’s right, many of them have YouTube videos, which means that you can find them on YouTube without spending a dime. And the fact that the training is not up to date is another red flag because some of the things they teach that used to work do not work anymore. In this fast changing world, it’s important to learn from training that it’s updated because that’s one of the ways you can make sure you are building your business the proper way. Products like Secret Millionaire Bot don’t contain all the information you need to know because they are usually created for the owner to profit. The sales page for Secret Millionaire Bot is full of red flags that are very common in other scams I have exposed. First of all, your access to this product will not be removed at midnight because you can check it out tomorrow and you can still get access to it. Second of all, the “few copies remain” claim is fake because there’s no limit when it comes to the amount of sales the owners of this product want to make. If their goal is to profit as much as possible, why would they limit the amount of people who can buy it? Third of all, Secret Millionaire Bot has no connection with CNN, Forbes or Huff post and it’s not available on Google Play or App store. If you do some research and look for this product on Forbes or other well-known websites, you will not find anything because there’s no connection between them. The reason they have added those icons on the sales page is to gain credibility and lead you to believe that this product is legit. If you decide to buy Secret Millionaire Bot, just after making the payment, you will be hit with some upsells that cost hundreds of dollars. Let me ask you, would it make sense that you got something that can allegedly make you a millionaire for only $37? It wouldn’t make any sense, don’t you agree? They first try to make you believe that you are getting so much for a very low price to get you to make the first payment. Once you have made the payment, they try to convince you to spend more money by telling you that you will accelerate or increase your profits if you purchase the other products. If you refuse to buy the upsells and go to the members area, you will realize that there’s nothing like they had promised you. So, how do I know this product costs waay more than $37? Well, I went to the page for affiliates to see how much affiliates can make and it says that it’s possible to earn over $450 per sale. Therefore, it’s clear that this product costs way more than $37. If affiliates earn 50% commissions on every sale, it means that the total cost could be $900 or more. Also, beware of one click upsells because these are the kind of upsells that only require you to click once to make the payment. I personally don’t like products that are not transparent about the upsells or hidden costs because I believe that knowing how much you need to succeed in a money-making opportunity is important to make sure this is something right for you. What else is fake about Secret Millionaire Bot? What about the owner of Secret Millionaire Bot? And the people who claim to have earned thousands of dollars? Truth be told, they are all fake. The owner has a fake name and all the testimonials are not real. The people who appear in the sales video a.k.a. the video testimonials are actors that sell their services on a freelance site called Fiverr. They claim to be making money with Secret Millionaire Bot because they have got paid to say it. And the Facebook and Twitter comments are obviously invented because they don’t exist. You can search for those tweets or those users and you will not find them, and you can’t even like/share/retweet or reply to those comments. As you can read, the testimonials don’t reflect the typical purchaser’s experience, which means that they are not accurate. They even mention Easy Insta Profits, which is a big red flag because Easy Insta Profits is a scam product that I exposed last year. I remember buying that product and didn’t even get access to the members area, which I explain in my Easy Insta Profits review. When it comes to the owner or the spokesperson, Charles Allen is not his real name because it says he’s using a pen name. Is Secret Millionaire Bot a scam? Whether Secret Millionaire Bot is a scam or not depends on you. Many people will call it a scam because it doesn’t live up to its promises and the sales presentation is very misleading. Other people may not consider it a scam because you get training for your money and you can also learn something. In my opinion, Secret Millionaire Bot is not a total scam because it’s a product sold through ClickBank, which means that you can get a refund if you buy it but end up not liking it. If it weren’t for ClickBank, I would be calling Secret Millionaire Bot a complete scam becuase of everything I have mentioned. With that said, I have decided not to buy it because it’s not worth my time. Yes, I could get my money back but I would still be wasting my time, and time is not possible to get back. So, what you end up doing is up to you. My final verdict is that I do not recommend Secret Millionaire Bot. How do I make passive income every day? 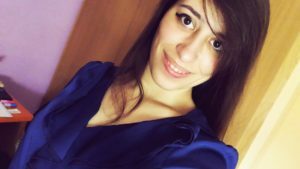 I want to be completely honest with you, so I’m not going to say that I use some kind of secret or push-button system to make money every say. Like I said, I earn passive income with affiliate marketing. This business model doesn’t require me to recruit anyone or make empty promises. Yes, not everyone who uses this business model to make a full-time ncome online is a scammer. There are scam artists but there are also ethical Internet marketers. With that said, I have to say that this business takes effort and time, so this is definitely not for people that need money immediately or people who are not willing to do the work. I told you I would be transparent with you, so I’m going to prove that I’m a real person. My name is Miren Ribera and you can find me on social networks like Facebook and Instagram. You see, I’m not hiding behind a pen name like the owner of Secret Millionaire Bot does. There are lots of people who started with no expertise or special skills and have still managed to achieved success. It’s all in the mind, if you believe you can achieve it, you will. Also, didn’t I mention that you can start today for free? You will be able to ensure this business is for you risk-free! See all the details in my guide! Additionally, you will discover how you can receive my personal guidance and how you can receive support from thousands of like-minded individuals, so you can rest assured knowing that you are not alone in this! And now let me ask you: Will you keep wasting your time on secret systems that don’t work? Or will you get on the right way to build your affiliate biz today? I hope this Secret Millionaire Bot review has been helpful to you and you will make the best possible decision. Online Innovations review – SCAM exposed? It’s NOTHING NEW! I don’t buy any money making product without carrying out diligent studies on the product and what it entails. This is to avoid falling prey to scam platforms and to save myself from the headache of wasting my time on the wrong thing. For me, any platform that promises outrageous income for a low price like the way secret billionaire is offering $37 is already a red flag to me. Some people that purchase products like this might not consider it a scam especially if they are just starting out online. Unfortunately, they would not be able to make money from it because the information they contain are outdated and they would have misled these newbies that don’t know much about the online world thinking they can make millions with just a little bit of effort. For the those that are experienced they would definitely consider this type of product a scam because they know how to easily identify products that are scam that doesn’t have the best interested of people at heart but rather only wish to put money into their own pockets. Never heard of this Secret Millionaire Bot before now, but so glad you took the time to see if they are legit business or scam. With the promise of that kind of money with little time requirements. With the use actors to records testimonials, the founder is fake, they promise something unrealistic by telling you that you can make money on autopilot without you doing anything. So many people would still fall for this, but with your review I know I will never be interested in secret millionaire bot. Thank you for sharing this to us! Thanks for sharing this article on the secret millionaire bot review. I have heard from a friend about this but I haven’t had the time to search properly online. Your article is on time. The promise of making over 2000 dollars a day by secret millionaire bot is unreasonable and unrealistic. This is no better than other scam applications out there ripping off people of their hard earned money. The owner having a fake name and fake testimonies are some of the many reasons to stay away from Secret Millionaire bot. I hope people don’t fall for this disguised scam application. The secret millionaire bit system, is another low quality program that is only looking out for the interest of the owners. This program is filled with a lot of make believes, it’s really difficult to imagine that this product could be legit. I’m not surprised, that it’s a fraudulent program. I do hope people come across this review before investing in this program. Million Dollar Months review – Is it a scam? Get Paid Daily System review – SCAM to AVOID or say bye to your money!